People just love penguins. From their little waddling feet to their black and white tuxedo coats, they’re just adorable. Even the largest of the penguins, the Emperor Penguin, is seriously adorable. However, what about a penguin that’s as tall as a person? Is that still adorable? What if that penguin has a super-long beak? At what point do penguins stop being adorable? 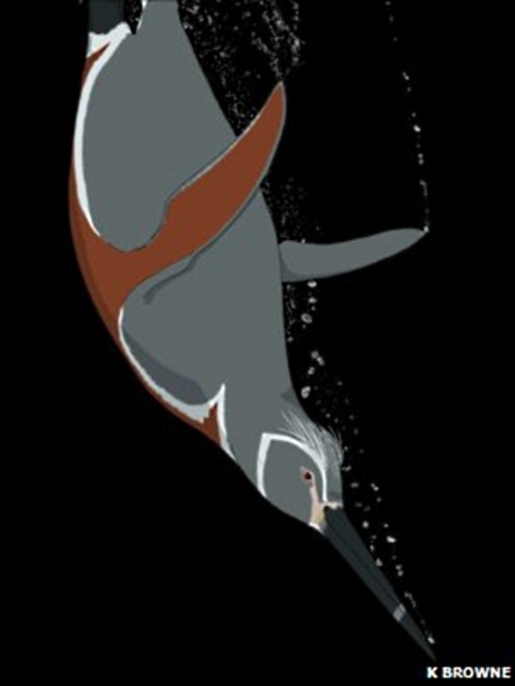 Well, judging by artist depictions of the Inkayacu paracasensis, or the Water King, even a newly-discovered prehistoric penguin ancestor is adorable! The Water King is a staggeringly huge, 5-foot-tall (1.5 meters tall) prehistoric penguin. Rather than rocking the stylish and classy black and white, the Water King’s feathers are actually believed to be gray with a brown belly! It’s strange, yes, but it’s still adorable. It’s like he’s wearing a furry wet suit! The Water King was discovered in Peru’s Reserva Nacional de Paracas by a team of American paleontologists lead by Julia Clarke.